Laurie Grossman of Mindful Impact has been bringing mindfulness training to young people in low income classrooms for many years. She has recently partnered with Temescal Associates and Aspiranet to pilot mindfulness training in Oakland Unified School District afterschool programs. Her full bio is below our interview with Ms. Grossman. Q: Can you briefly explain what mindfulness is? A: Mindfulness is awareness of the present moment without judgment. Many of us miss a lot of our lives because we live in the past or the future; we spend most of the time in our heads reliving what has already happened or worrying about what is going to happen. By practicing mindfulness, one learns to live more often in the present moment; benefitting from what is actually occurring right now. One of the most common ways to practice mindfulness is to focus on the breath as an anchor to the present. Q: In what sectors is mindfulness being used? An ability to cope more effectively with both short and long-term stressful situations. In addition to the physical and mental health communities, mindfulness is being used in corporate settings such as Google, Facebook, EBay, Genentech, and General Mills, just to name a few. The National Institute of Health just awarded the US military $900,000 to research the use of mindfulness with the army. Q: Why is mindfulness effective with young people? And why are they easily engaged? A: Mindfulness lessons are interactive, short and impactful. When teaching mindfulness we are teaching children about themselves; the curriculum is relevant to them and therefore engaging. Students tell us they can concentrate more easily on their schoolwork, they can calm themselves down, and they feel less stress. The benefits of mindfulness occur rather quickly, students feel better as a result and they like to practice. The very first mindfulness lesson we offered in an Oakland public school resulted in this comment from a third grader, “I think if we do this every day we won’t fight anymore.” I was stunned because the school was one where violence in the community was common. How could 15 minutes of listening to sound result in an eight year old saying he wouldn’t fight anymore? The answer lies in neuroscience. Mindfulness helps create new neural pathways in our brains. Being in the present moment, that is being aware of your breath and knowing that you are aware of it stimulates a variety of positive hormones and stimulates the rest and digest side of the nervous system. In other words, most students like to engage in mindfulness because it feels good to do so. Most of us spend a large percentage of our lives in our heads, instead of in the present moment. When a student arrives in the classroom, he or she may not be ready to learn; perhaps the student is preoccupied with other things - an argument in the home, walking by a drug dealer on the way to school or a disagreement with a friend on the playground. Without using mindfulness, that experience might be what preoccupies him or her during the English or math lesson. 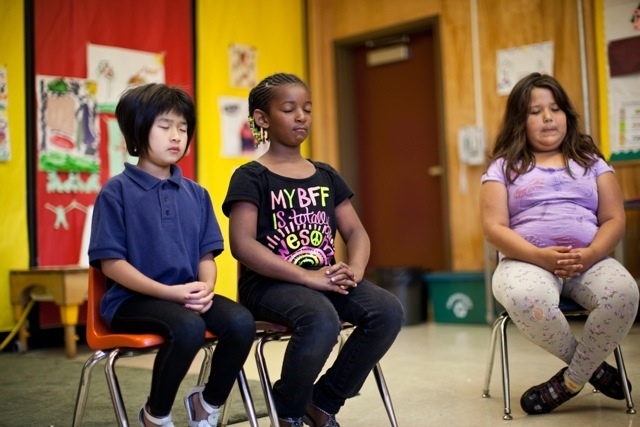 Mindfulness brings students into the present moment – paying attention becomes easier to do. Students find that they have more control over their emotions when they use mindfulness because awareness enables them to respond to a stimulus rather than reacting to it. Instead of lashing out at someone and getting in trouble for it, they are able to use their words or ask for help. Making better decisions and responding instead of reacting feels good and students engage with mindfulness because the benefits become apparent rather quickly. Q: Why do you think mindfulness is an important school-based tool? A: The benefits for children in school are multiple. 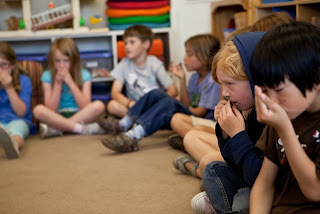 Mindfulness teaches children to pay attention, it enhances their impulse control, reduces stress for student and teacher and helps to build community. Laurie Grossman has spent her career seeking social justice and educational equity for low-income children and communities. At Park Day School in Oakland, California, she created a Community Outreach Program to develop public/private partnerships for 19 years, Mindful Schools being the most recent. 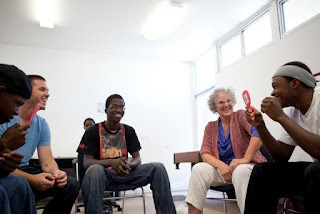 With a group of committed colleagues, Grossman and team brought mindfulness programs to 11,000 children in 42 schools (71% of them low-income students) and training to 1,500 educators before separating from Park Day School to become an independent non-profit organization. Grossman has recently founded a new organization, Mindful Impact, to continue her commitment to bringing mindfulness to low-income communities. She is currently working with Temescal Associates to take mindfulness programs into afterschool settings. I would love it if we had these after school programs in Mokena IL. I love my kids, but they could use a bit more focus.